Each automatic step is followed by a manual verification step in order to verify the algorithm’s results. The script is prepared to run locally without arguments, as well as in a cluster environment by using “pid_str” argument. The pid_str argument is a char with format ‘N/M’, being N <= M with default value ‘1/1’. You can partition a big job into M pieces in cluster architecture, by starting M processes with N ranging from 1 to M.
You can watch a typical run of this script for small, local ECG recording on YouTube. user_str (optional) string to identify this run or experiment. % Explore the *examples_path* for ECG recordings. % But you can use this to iterate for all of them. % In case of running in a user-assisted fashion. % For cluster or distributed environment processing. % just for debugging, keep it commented. The way of performing QRS detection (or almost any other task in this ECGkit) is through an ECGwrapper object. The objective of this object is to abstract or separate any algorithm from the particular details of the ECG signal. This object is able to invoke any kind of algorithm through the interface provided of other object, called ECGtask objects. 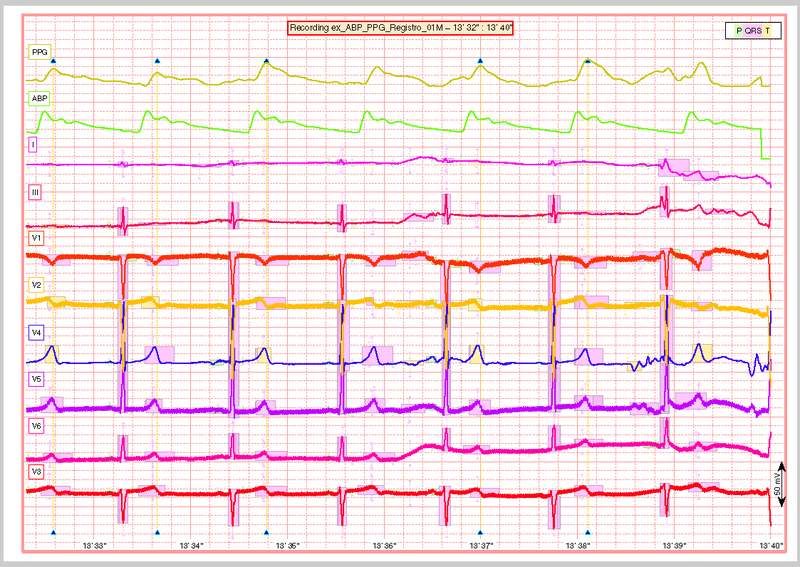 The ECGtask objects actually perform specific task on the ECG signal, in this case, the QRS complex detection. Each task have general properties such as progress_handle (see ECGtask class properties for more details) and other specific for a certain task, such as detectors, only_ECG_leads, wavedet_config, gqrs_config_filename (see others in QRS detection task). %         ECGt_QRSd.detectors = 'pantom';  % Pan-Tompkins alg. %         ECGt_QRSd.detectors = 'gqrs';    % WFDB gqrs algorithm. %         % Example of how you can add your own QRS detector. %         "your_QRS_detector_func_name" can be your own detector. 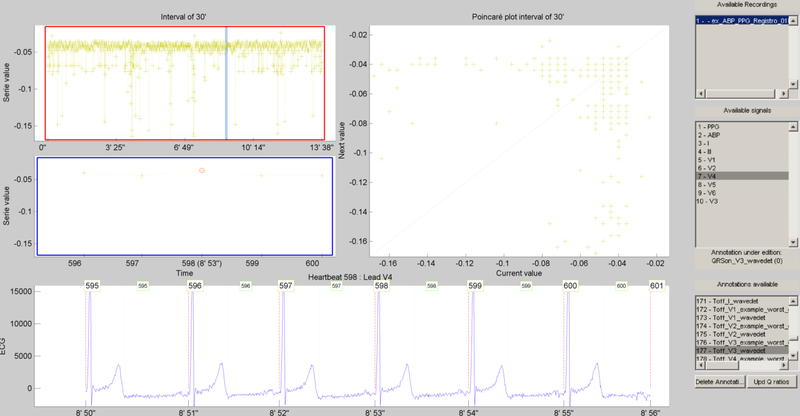 ECGt_QRSd.only_ECG_leads = true;    % Identify ECG signals based on their header description. % collect object if were recognized as ECG recordings. % at the end, report problems if happened. This part of the example uses a graphical user interface (GUI) to allow the user correcting mistakes that the previous automatic algorithm eventually makes. As can be seen in the following code, the first step is checking that the previous QRS detection task finished without problems. Then if no errors, the corrector will use as starting point the result of this same task, in case the user would like to edit a previously edited result, or if not available the result of the QRS detection task. % last worker is the responsible of the visual correction. % if there are not any previous error. % This task is supposed to be supervised, so only one pid is enough. % value again in order to avoid performing the following tasks every time. Then the task invoked by the wrapper object is changed to QRS corrector task and the GUI is presented to the user. In case the recording includes pulsatile signals, such as plethysmographic (PPG) or arterial blood pressure (ABP), this kit includes the PPG/ABP automatic detector task which allows the use of two algorithms to perform peak detection, WavePPG and Physionet’s wabp. % set the delineator task name and run again. 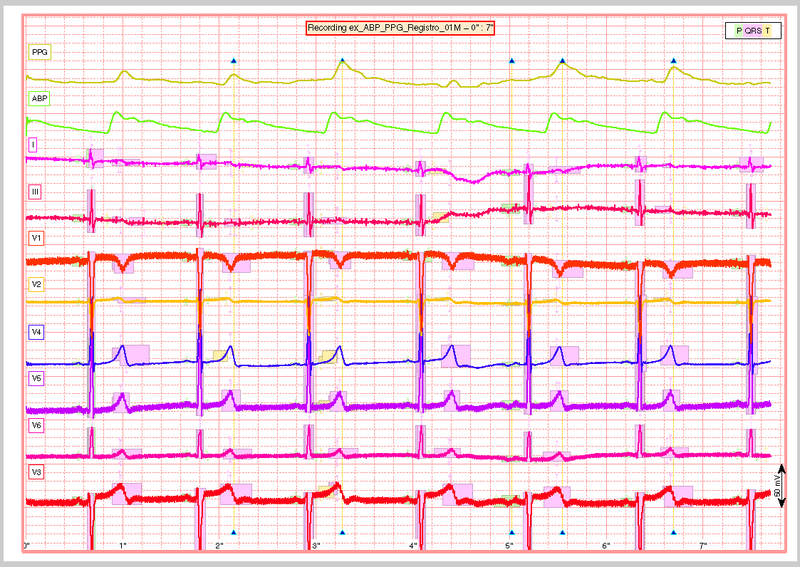 The same manual verification made for automatic QRS detection algorithms can be performed with pulsatile signals. The PPG/ABP corrector task was designed to allow users the verification and correction of automatic detections through the same GUI. The following code shows how to use this task. As you can note, the interface is almost the same used for the QRS correction task. 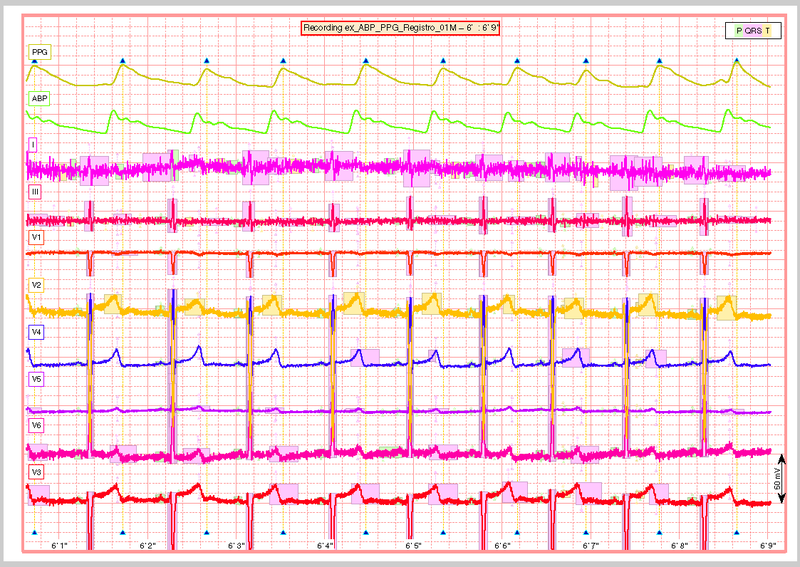 Once the QRS complexes were detected, each heartbeat can be segmented or delineated into P-QRS-T waves. To achieve this the kit includes an ECG delineation task to interface with the wavedet and others user-defined algorithms, as described in the task help. The interface follows the same guidelines described before, as is shown in the following code. % performs automatic QRS detection. % perform delineation in those leads. %         % Example of how you can add your own ECG delineator. %         "your_ECG_delineator_func_name" can be your own delineator. The same manual verification made for all the previous automatic tasks is repeated for ECG delineation. The ECG delineation corrector task was designed to allow users the verification and correction of automatic delineation through the same GUI. The only difference with respect to the behaviour of the QRS or PPG/ABP correction GUI, is that addition of new events to the P-QRS-T series is not allowed, in order to keep the assosiation of a wave fiducial point to a heartbeat. The a2hbc algorithm can opperate automatically or assisted by the user, for more details check the a2hbc documentation. And finaly a snapshot of the last part of the recording. This is the code used to create a PDF report. filename = ; % default setting. Let the report function decide. %     filename = 'container_filename'; % to put everything in one big file. % explore the recordings, and the algorithm results. % last worker is the responsible of the reporting. Maybe the most important and useful aspect of the kit, is that you can add your own algorithms. This can be done by following the interface documented through the several examples included above. The QRS detection and ECG delineation tasks already include a way to interface your own algorithms through the user:function_name method. Check the above sections for more details.